"b-boy" is a tribute to the early boogie boys of the Bronx, the original poppin’ & lockin’ dancers who kept the parties live back in the day, back when hip-hop was in its golden, embryonic stage. Using various ‘lo-fi’ materials and surfaces, such as found cardboard, wood, and linoleum, Ward harks back to the essence of the early ingenuity and innovation of hip hop. During the 70’s and early 80’s, kids used a wide variety of surfaces to dance on and perform stylized acrobatic moves. Using what was available, they proved again and again that the brightest sources of creativity often come from the most humble of places. 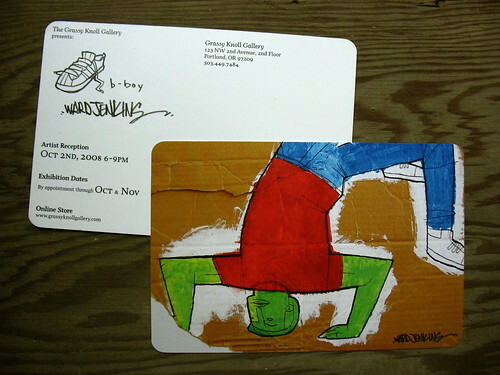 “b-boy”is a tribute to the beginnings of that movement, before the uninformed media brought it to near-fad status. All you Portland and/or NW peeps: hope you can make it! It'll be fun to finally meet you all. Don't forget, it's next Thursday! I'm curious about the Animators For Hire event, wherein any jobseeker can get a short interview with various companies in the industry. Not sure how it's going to go for me, mainly because I'm probably a hard sell. Honestly, I'm not making it easy for myself: I mean, seriously? A former director who's been in the industry for 12 years, looking for freelance gigs because he'd rather stay in Portland? I'm not like these young kats, fresh, green and wet behind the ears, just itching to get their foot in the door and willing to move anywhere at the drop of a hat. Hopefully, my experience along with my quirky way of looking at things will win these potential employers over. That, along with my dashing good looks. Har har. 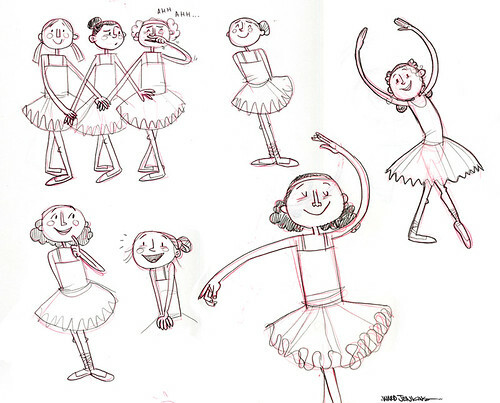 Get the inside scoop on how animation school curricula fares in the real world. Are institutions giving graduates the tools they need to survive and meet the needs of an ever-changing animation industry? Listen in on the debate with representatives from top schools and productions houses from Canada and the states. J.J. Sedelmaier, President / Director, JJ Sedelmaier Productions, Inc.
Ward Jenkins, Animation Director, Drawn! To prepare for this panel, I thought I'd open the floor to you guys and see what sort of questions do you think I should ask? What should be addressed that you think is being largely overlooked? Is there anything that frustrates you about the current state of animation education, not to mention trying to get a job in the industry after graduation? Please feel free to ask away here, or send me a message via email (check my profile). They usually record panel discussions at OIAF, so there's a possibility that you can hear what we talk about at a later date. I'll keep you posted. If I like your question, I'll probably give a nod to you, if that's okay. Let me know otherwise. 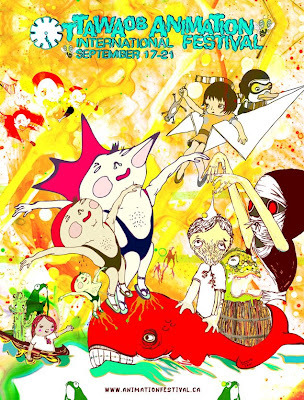 For the OIAF schedule click here. I may do a follow up post here mentioning what screenings and panels I'll be checking out. So, yes....this week is about getting ready. Looking forward to it! Hope to see you there. If you are going, feel free to contact me and maybe we'll run into each other. I said 'maybe'. Oh, and I prolly will tweet the entire time I'm there, too. Just so you know. It was probably the craziest summer ever experienced in our 14 years together. But we endured. And we enjoyed, believe it or not. 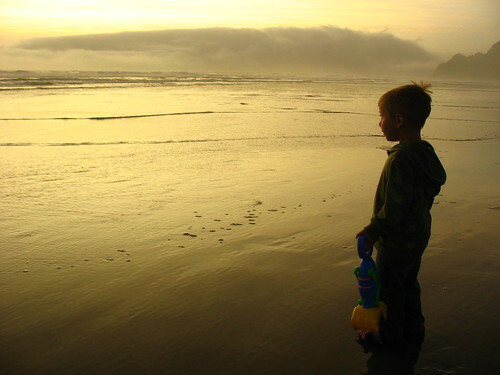 So long, Summer '08. You were a doozy. Thanks for the memories. Something I did recently for a potential job. Didn't get it, but that's okay. 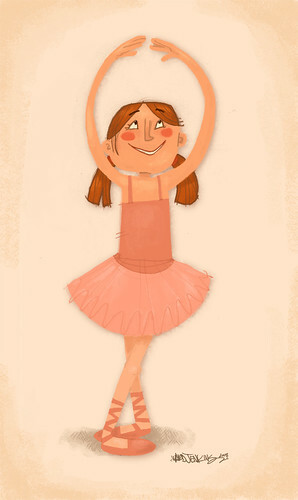 I now have ballerinas in my illustration arsenal. 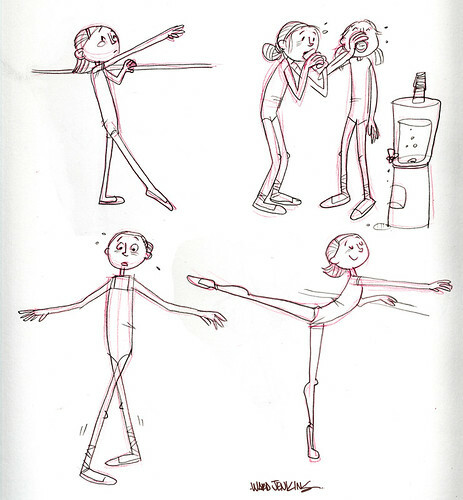 Girls are so awkward at this age, especially when it comes to getting ballet poses right. It was fun trying to come up with some scenarios you see here. Wow, it got real girly around here all of a sudden, didn't it? Oh, well. Enjoy your Labor Day, folks.